Do you want to create a creative and unique coffee table but hesitant to spend money on it? 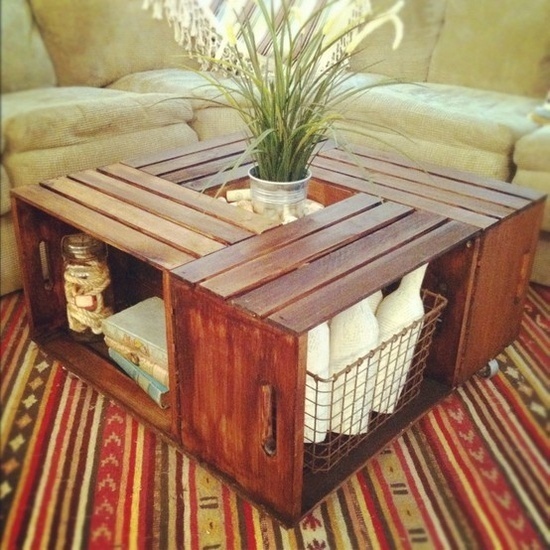 Well if you have existing crates that you can spare you can make it very functional by making it a nice coffee table. You don't need much because you only have to stained it or paint with your beautiful wood color, nailed them together and voila you have your stylish and affordable table. You can place it at the center of your living room where you and your friends can enjoy your black or creamy cups of your favorite coffee. I always love enjoying my coffee at home especially at night when I rest from work or sometimes when I'm finishing some writing tasks. I think that it would help if you have a nice table to enjoy your coffee time with others. This table would certainly be an inspiration to others who want to make their own unique or self made table especially those who don't have enough budget for the expensive kinds. Such creativity.